You are here: Home › Events › Rally with SRLP in the annual Trans Day of Action! 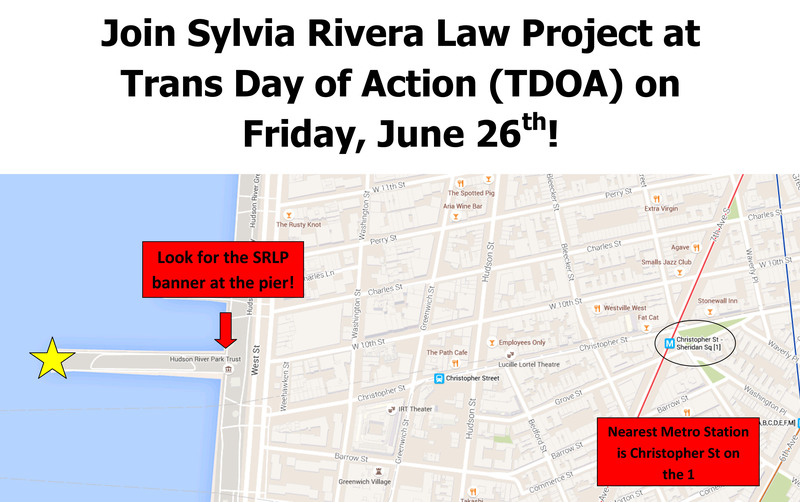 Come rally with SRLP on Friday, June 26rd, the 11th annual Trans Day of Action! Trans Day of Action is an annual march initiated by Trans Justice of the Audre Lorde Project to demand for social and economic justice. SRLP’s members will be meeting in SRLP’s office at 2:00 pm on Friday to head to the march together. The march will begin from 4:30 pm at the Christopher Street Pier/ Pier 45 and ends at 6:30 pm. Read more about Audre Lorde Project’s Points of Unity for Trans Day of Action here.